In 2008, the world’s first Group of Eight (G8) University Summit was held in Sapporo, Hokkaido, Japan. 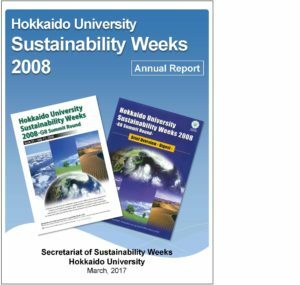 In this summit, Hokkaido University took an important role and twenty seven representatives of world leading universities and educational institutions gathered and adopted the “Sapporo Sustainability Declaration (SSD).” The SSD states universities’ responsibility as the driving force for developing a sustainable society. Recognizing the expanding role of scientists and universities, the subject of discussion was the responsibility of universities to contribute towards the attainment of sustainability, and the specific actions they must undertake to fulfil that responsibility. The presidents of the attending universities at the G8 University Summit hope that universities all over the world will endorse this declaration and take appropriate actions in their respective countries and regions. The SSD and the G8 University Summit are summarized into the report below. 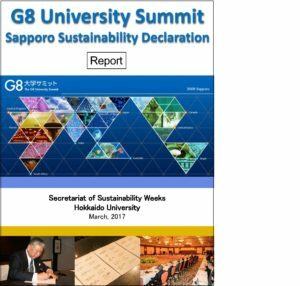 Here are the publicity materials and press releases related to the G8 University Summit and/or Sapporo Sustainability Declaration. Please download them below. 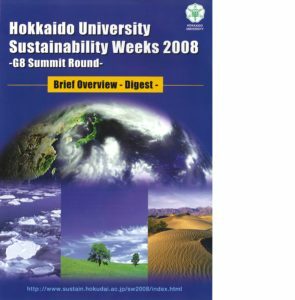 In response to the G8 Hokkaido Toyako Summit, Hokkaido University held about 50 events including an international symposia discussing global environment, health, poverty and public lectures during SW2008. *Please click here for the Japanese website.